Yu-Gi-Oh! is a strategic trading card game in which two players Duel each other using a variety of Monster, Spell, and Trap Cards to defeat their opponent's monsters and be the first to drop the other's Life Points to 0.Card Type: Effect MonsterCard Number: YG07-EN001Set: GX Manga Promotional Cards: Series 7Attribute: WaterLevel: 8Monster Type: SpellcasterPasscode: 28348537Card Text: You can Tribute Summon this card by Tributing 1 Spellcaster-Type monster. 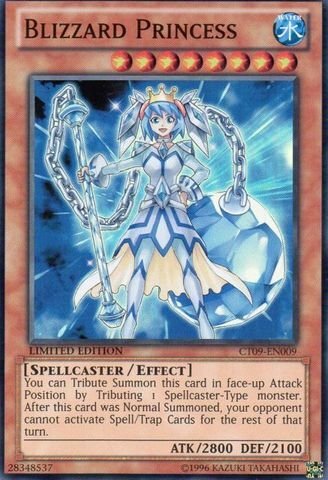 During the turn this card is Normal Summoned successfully, your opponent cannot activate Spell/Trap Cards. Yu-Gi-Oh! 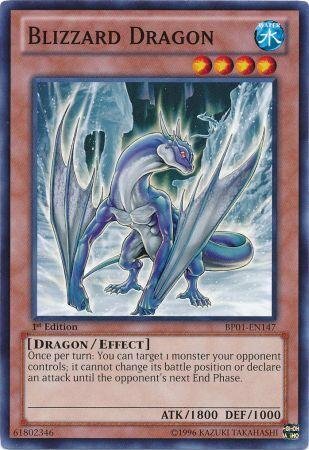 is a strategic trading card game in which two players Duel each other using a variety of Monster, Spell, and Trap Cards to defeat their opponent's monsters and be the first to drop the other's Life Points to 0.Card Name: Blizzard DragonCard Type: Effect MonsterCard Number: BP02-EN075Set: Battle Pack 2: War of the GiantsAttribute: WaterLevel: 4Monster Type: DragonPasscode: 61802346Card Text: Once per turn: You can target 1 monster your opponent controls; it cannot change its battle position or declare an attack until the opponent's next End Phase. Yu-Gi-Oh! 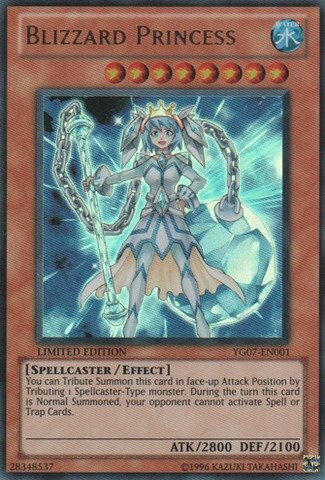 is a strategic trading card game in which two players Duel each other using a variety of Monster, Spell, and Trap Cards to defeat their opponent's monsters and be the first to drop the other's Life Points to 0.Card Name: Blizzard PrincessCard Type: Effect MonsterCard Number: CT09-EN009Set: 2012 Collectors TinsAttribute: WaterLevel: 8Monster Type: SpellcasterPasscode: 28348537Card Text: You can Tribute Summon this card in face-up Attack Position by Tributing 1 Spellcaster-Type monster. During the turn this card is Normal Summoned, your opponent cannot activate Spell or Trap Cards. Yu-Gi-Oh! is a strategic trading card game in two players Duel each other using a variety of Monster, Spell, and Trap Cards to defeat their opponent's monsters and be the first to drop the other's Life Points to 0.Card Name: Blackwing - Blizzard the Far NorthCard Type: Tuner MonsterCard Number: GLD3-EN024Set: Gold Series 3Attack/Defense: 1300/0Attribute: DarkLevel: 2Monster Type: Winged BeastPasscode: 22835145Card Text: This card cannot be Special Summoned. 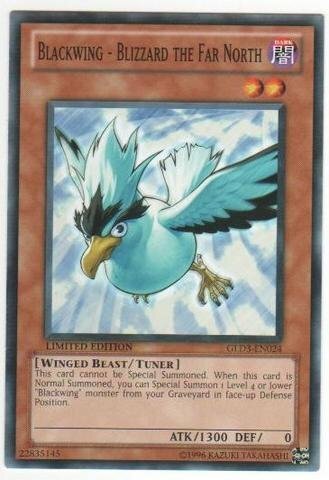 When this card is Normal Summoned, you can Special Summon 1 Level 4 or lower "Blackwing" monster from your Graveyard in face-up Defense Position. Yu-Gi-Oh! 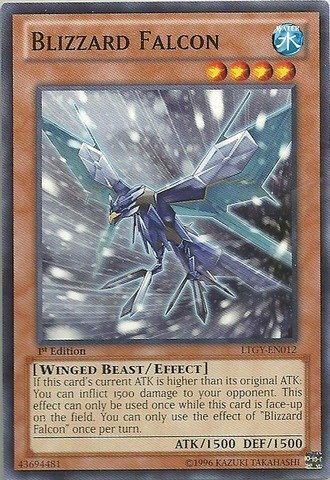 is a strategic trading card game in two players Duel each other using a variety of Monster, Spell, and Trap Cards to defeat their opponent's monsters and be the first to drop the other's Life Points to 0.Card Name: Blackwing - Blizzard the Far NorthCard Type: Tuner MonsterCard Number: DP11-EN003Set: Duelist Pack 11: CrowAttack/Defense: 1300/0Attribute: DarkLevel: 2Monster Type: Winged BeastPasscode: 22835145Card Text: This card cannot be Special Summoned. 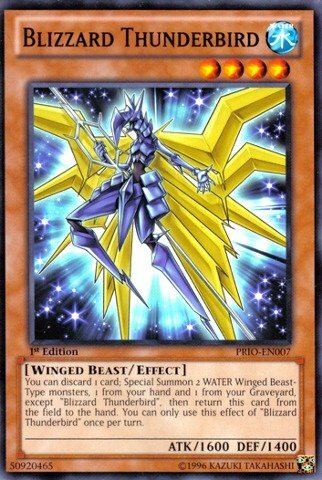 When this card is Normal Summoned, you can Special Summon 1 Level 4 or lower "Blackwing" monster from your Graveyard in face-up Defense Position. Yu-Gi-Oh! is a strategic trading card game in which two players Duel each other using a variety of Monster, Spell, and Trap Cards to defeat their opponent's monsters and be the first to drop the other's Life Points to 0.Card Name: Blizzard ThunderbirdCard Type: Effect MonsterCard Number: PRIO-EN007Set: Primal OriginAttribute: WATERLevel: 4Monster Type: Winged BeastPasscode: 50920465Card Text: You can discard 1 card; Special Summon both 1 WATER Winged-Beast-Type monster from your hand and 1 from your Graveyard except "Blizzard Thunderbird" then return this card on the field to the hand. 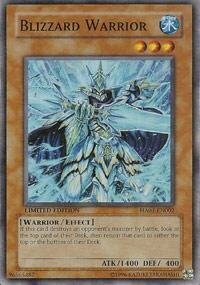 You can only use the effect of "Blizzard Thunderbird" once per turn. Yu-Gi-Oh! is a strategic trading card game in two players Duel each other using a variety of Monster, Spell, and Trap Cards to defeat their opponent's monsters and be the first to drop the other's Life Points to 0.Card Name: Blizzard WarriorCard Type: Effect MonsterCard Number: HA01-EN002Set: Hidden ArsenalAttack/Defense: 1400/400Attribute: WaterLevel: 3 Monster Type: WarriorPasscode: 96565487Card Text: When this card destroys an opponent's monster by battle, look at the top card of your opponents Deck, then return it to either the top or bottom of the Deck. Yu-Gi-Oh! is a strategic trading card game in which two players Duel each other using a variety of Monster, Spell, and Trap Cards to defeat their opponent's monsters and be the first to drop the other's Life Points to 0.Card Name: Blizzard FalconCard Type: Effect MonsterCard Number: LTGY-EN012Set: Lord of the Tachyon GalaxyAttribute: WaterLevel: 4Monster Type: Winged BeastPasscode: 43694481Card Text: If this card's current ATK is higher than its original ATK: You can inflict 1500 damage to your opponent. This effect can only be used once while this card is face-up on the field. 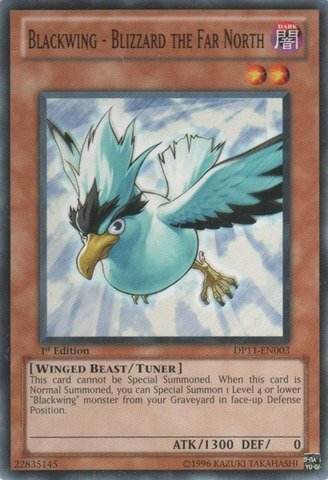 You can only use the effect of "Blizzard Falcon" once per turn.If this card's ATK becomes higher than its original ATK: Inflict damage to your opponent equal to the difference between this card's original ATK and current ATK. Yu-Gi-Oh! 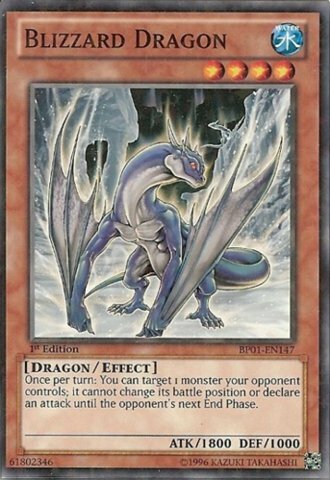 is a strategic trading card game in which two players Duel each other using a variety of Monster, Spell, and Trap Cards to defeat their opponent's monsters and be the first to drop the other's Life Points to 0.Card Name: Blizzard DragonCard Type: Effect MonsterCard Number: BP01-EN147Set: Battle Pack: Epic DawnAttack/Defense: 1800/1000Attribute: WaterLevel: 4Monster Type: DragonPasscode: 61802346Card Text: Once per turn, if this card would be destroyed by battle, it is not destroyed. 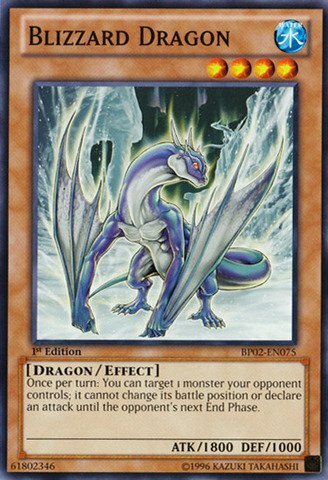 Compare prices on Yugioh Blizzard at ShoppinGent.com – use promo codes and coupons for best offers and deals. Start smart buying with ShoppinGent.com right now and choose your golden price on every purchase.